While we have yet to see the details of this FIPA, it is likely that it gives corporations the same rights contained in NAFTA and the Canada-EU Comprehensive Economic and Trade Agreement (CETA), now in negotiation. FIPAs give corporations of one country the right to sue the government of another country for imposing domestic environmental, health and safety, and human rights standards that negatively affect their bottom line. American firms have used NAFTA to extract over $160 million from lawsuits against Canadian public policy. As well, in 2010, under a FIPA threat but without even going to a NAFTA tribunal, the Harper government paid $130 million to American pulp and paper giant Abitibi Bowater, for the water and timber “rights” it left behind when the company voluntarily abandoned its operations in Newfoundland. This set a dangerous precedent for foreign companies to claim water and resource rights in other countries. China has been an attractive base for global manufacturing and exporters because of its abundant natural resources (now threatened from decades of abuse), extremely low wages, and lax environmental standards. The political and human rights situation in China remains abysmal. Social unrest is increasing and the extent of environmental degradation from rapid industrialization is truly shocking. The newly signed investor-right deal will provide yet another barrier in the way of needed reforms in China. The last thing Canada should be pushing in China right now is a legal right-of-way for Canadian corporations to challenge measures that interfere with their profits. There are threats to Canadian environmental and human rights standards from this deal too. The flip side of this investment deal is that new Chinese investment in the tar sands or the uranium mines would be locked in as Chinese investors would have the same right to sue Canada for any new rules to protect the environment, local communities or First Nations peoples from harmful, intrusive extractive industry practices. Yet Stephen Harper is aggressively selling Canada’s tar sands and other energy and natural resources to China and willing to give it investor rights unavailable to Canadian firms operating domestically. 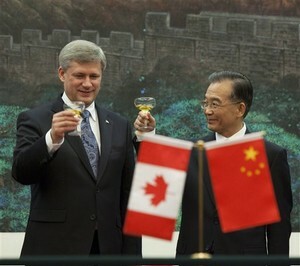 Accompanying Harper in China is none other than Patrick Daniel, head of Enbridge, the company planning to build the Northern Gateway pipeline that would carry Alberta bitumen to ports in B.C. to be shipped by tanker to China. In giving the company such a prominent role in the China trip, Harper is making a mockery of his own government’s environmental assessment hearings on Gateway, clearly signalling his eventual approval of the project regardless of the outcome of the review. Daniel is joined by Marcel Coutu, CEO of Canadian Oil Sands Ltd, which holds a stake in the syncrude oil venture along with China Petroleum Corp, Tim Gitzel, chief executive of Cameco Corp, the world’s largest uranium producer, and 37 other corporate executives. Canada is indeed open for business. Instead of promoting corporate friendly trade and investment deals that profit only the privileged, Canadians should be standing shoulder to shoulder with the Chinese people seeking better working conditions, improved human rights, and a clean environment in both our countries. The China trip makes it clear once and for all that Stephen Harper has put human rights on the back burner and seeks to promote the interests of the global energy and extractive industries at all costs. This entry was posted in Organizing, Tar Sands, Their Governments. Bookmark the permalink. Harpuke just wound up his junket to the state capitalist Stalinist heartland to initiate yet another monstrous destructive corporate scam called the Trans-Pacific “free trade” (barf) Agreement–there’s no end to these dictatorial corporate-backed incompetents’ dedication to medieval stupidity.